ABSTRACT. Leatherback turtles (Dermochelys coriacea) have declined dramatically in the eastern Pacific Ocean (EP) in recent decades. Traditionally, population assessments have relied on the numbers of turtles on the beaches with the highest abundance of turtles (index beaches) and often disregarded the importance of nesting beaches with smaller, but still regular, numbers of nesting turtles (secondary beaches). We characterize leatherback nesting on secondary beaches throughout Pacific Costa Rica. Nesting distribution was significantly reduced since the 1990s and it currently appears to be constricted to the Santa Elena and Nicoya peninsulas. Over the past five years, nesting abundance on secondary beaches was low, ranging between 0.4 ± 0.5 and 5.3 ± 1.5 females and 3.8 ± 5.2 and 22.8 ± 10.8 nests per beach and per year. There was some exchange of turtles between beaches. The exchange rate (percentage of females that nested at least once on a different beach) ranged between 7% and 28%. While Caletas still registers multiple clutches that are laid by 1 -2 females in some years, it may no longer qualify as a secondary beach due to the infrequent nature of nesting events registered recently and the total absence of nests in some of those years. Although nesting abundance is relatively low at secondary beaches, they host at least ~25% of total leatherback nesting abundance in Costa Rica. As the EP leatherback turtle declines, not only do the numbers of nesting turtles decrease but local extirpations are occurring on, previously categorized, secondary beaches. The critically low number of turtles at present may prevent recolonization of sites where they have been extirpated. Keywords: metapopulation, sea turtle, index beach, secondary beach, endangered, declining population. Metapopulation theory focuses on the interactions and distribution of spatially-separated subpopulations, the persistence of which depends on the balance between extinctions and recolonizations (Hanski & Gilpin, 1991; Hanski, 1998). Genetic flow and recolonizations are driven by the dispersion of individuals from extant subpopulations via the "rescue effect" (Ebenhard, 1991). The rate at which this may occur is, in turn, dependent on the 1) distance between sites and 2) dispersion rates (Ebenhard, 1991). However, recolonization may not be possible in declining populations that have reached critically low abundances. Understanding metapopulation dynamics and conservation biogeography is one of the global research priorities for the conservation of sea turtles in the 21st century (Hamann et al., 2010). In particular, the factors behind the dispersion and demography of subpopulations within metapopulations are considered as critical information for population assessments. Sea turtles nest on tropical and subtropical beaches, and population assessments of sea turtles are generally based on the number of females nesting on a particular beach. However, some exchange of individuals between nesting sites within a region occurs (Miller, 1997). Furthermore, sea turtle metapopulations could be complex and the characteristics of the different subpopulations, as well as the relationships among each other, may play an important role in their dynamics. Metapopulation assessments may therefore be particularly important when the number of nesting turtles reaches critically low levels that may prevent exchange between nesting sites and thus result in local extirpations. The nesting range for leatherback turtles (Dermochelys coriacea) along the coast of the eastern Pacific Ocean (EP) extends from Northern Mexico to Panama, with peak activity concentrating in Mexico and Costa Rica. Conservation efforts in Mexico have been focused on four index beaches (Mexiquillo, Tierra Colorada, Cahuitan and Barra de la Cruz; Sarti-Martinez et al., 2007), while conservation efforts in Costa Rica have been focused at Parque Nacional Marino Las Baulas (PNMB), a complex comprising three nesting beaches (Playa Grande, Ventanas and Langosta; Santidrian-Tomillo et al., 2007). In Costa Rica, the level of exchange between the beaches in PNMB is ~20% per season (Santidrian-Tomillo et al., 2007), but the number of nesting turtles and the level of exchange have yet to be quantified on other beaches of secondary importance outside of PNMB. Based on annual surveys at index beaches, the overall abundance of EP leatherbacks has declined exponentially (>90%) across their nesting range since the 1980s (Santidrian-Tomillo et al., 2007; Sarti-Martinez et al., 2007; Wallace et al., 2013) Due to the decreasing abundance of EP leatherbacks at index sites, we need to identify additional opportunities for targeted conservation efforts to protect remaining nesting females and their offspring at secondary nesting sites as well. The term "index beach" is used to refer to selected beaches or sites where nesting activity is most intense and/or sites that are monitored regularly and over the long-term to provide an indication of population trends (SWOT, 2011). Thus, secondary beaches can be considered nesting sites where turtles nest regularly, are used by the same subpopulation of turtles that nest on the index beach(es) and are of secondary importance due to lower intensity of nesting activity. While the benefit of allocating resources for research and conservation on index beaches is clear, the relative importance of secondary beaches to the metapopulation is less obvious. Due to funding and/or logistic limitations, secondary beaches are often disregarded. However, given the urgent need to protect nesting females and enhance hatchling production of endangered sea turtle populations such as EP leatherbacks, a thorough understanding of the complete nesting distributions, including secondary beaches, and how turtles utilize available nesting habitat within those distributions, would inform expanded conservation efforts that include secondary beaches. We hereby conduct a first assessment of secondary nesting beaches for leatherback turtles in Costa Rica. In particular, we report on nesting abundance and protection level of secondary beaches, and compare current nesting activities to estimates obtained in the 1990s from aerial and ground surveys. Finally, we discuss the relative importance of these secondary nesting sites for the Costa Rican subpopulation of EP leatherback turtles. As leatherback turtles are critically endangered in the EP, understanding the dynamics among nesting sites and the conservation challenges of each site is essential to dictate policy directed towards the prevention of local extirpations and allow recoveries. As a first step toward characterizing the complete nesting distribution in Costa Rica, we conducted a workshop in March 2013 to identify sites where leatherback turtles nested outside PNMB. At the workshop, we identified 8 sites that could qualify as secondary beaches due to the occurrence of regular nesting events. These were: Naranjo, Cabuyal, Nombre de Jesús, Marbella, Junquillal, Ostional, Camaronal and Caletas. Other sites were also identified but these beaches are not considered secondary sites as nesting was sporadic. For this study, we acquired information from 5 of identified secondary nesting beaches: Naranjo, Cabuyal, Nombre de Jesús, Ostional and Caletas. For each site, we determined: 1) nesting abundance, 2) protection level, and when possible 3) exchange rate between nesting sites. 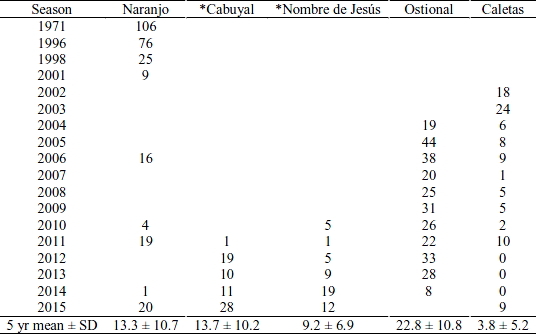 Data for Cabuyal and Nombre de Jesús were only available from 2010 and 2011 respectively, while data from Ostional and Caletas were available from 2004 and 2002 respectively. The longest data set was provided for Naranjo, which was intermittently covered from 1971 to 2015. Nesting abundance was estimated as the number of verified nests and/or nesting females. When number of nests was not available, we estimated it by multiplying the number of body pits by the mean nesting success (90%) determined by the multi-decade monitoring program in PNMB as estimated in Reina et al. (2002) and corrected with recent data. Females were identified with Passive Integrated Transponders (PITs) (Reina et al., 2002) and occasionally metal ID tags. We compared our results to those obtained from aerial surveys and ground surveys conducted in seasons 1996-1997 and 1997-1998 along the entire Pacific coast of Costa Rica (Mayor, 1998). Protection level was categorized by official protection status as: 1) National Park, 2) Wildlife Refuge or 3) not protected under an official management category in accordance with the management categories of the National System of Conservation Areas (SINAC) of Costa Rica. Our comparison of historical (1990s) and present day leatherback nesting activities in Pacific Costa Rica revealed a contraction of the population's overall nesting distribution from more than 10 sites to 5 sites that host regular nesting, including PNMB. 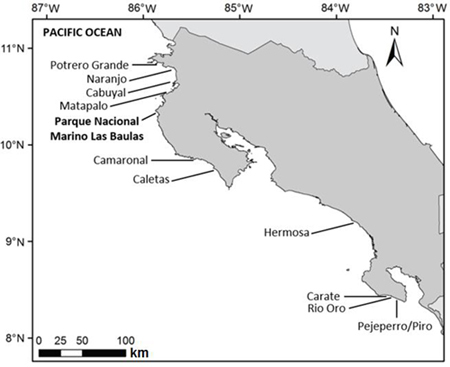 In the 1990s, the 10 most important identified leatherback secondary nesting beaches outside PNMB were (North to South): Potrero Grande, Naranjo, Cabuyal, Matapalo, Camaronal, Caletas, Hermosa, Carate, Río Oro and Pejeperro/Piro (Fig. 1) (Mayor, 1998). Of those, Hermosa, Carate, Río Oro, Pejeperro/Piro and possibly Caletas seem to currently only be receiving sporadic nesting. Based on preliminary information gathered at the 2013 workshop, Camaronal and Junquillal could qualify as secondary nesting beaches, although the number of nests was low at Camaronal, but we could not obtain detailed updated information on these sites for this study to verify their status. Levels of nesting at Potrero Grande and Matapalo are unknown and therefore, could either be secondary or sporadic. In contrast to the historic distribution of leatherback nesting along the Pacific coast of Costa Rica, secondary nesting beaches are currently restricted to the Nicoya and Santa Elena peninsulas (Fig. 2). 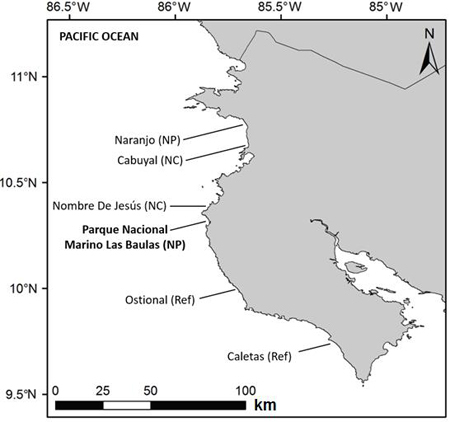 We identified four important secondary beaches (North to South): Naranjo, Cabuyal, Nombre de Jesús and Ostional, where leatherback turtles nested regularly with at least one nesting event registered per year throughout the period of study (Fig. 2). Caletas may no longer be considered as a secondary nesting beach, despite having registered nesting events regularly throughout the 2000s, as no leatherbacks nested there over three consecutive years (2012-2013 to 2014-2015) and the mean annual number of females over the last five years was lower than one turtle. no official management category (NC). As expected, the number of turtles and nests registered on secondary beaches were low (Tables 1-2). On average, 62.8 ± 7.0 nests (25%) were registered per year in the last five years on secondary beaches and 184.8 ± 44.1 nests (75%) per year at PNMB over the same time period. The site with the highest number of turtles and nests was Ostional, whilst the site with lowest abundance was Caletas. 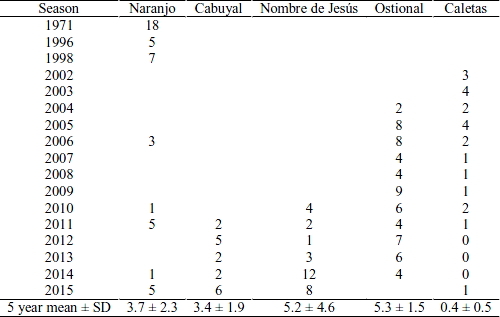 Mean (± SD) annual number of turtles over the last five years ranged between 3.4 ± 1.9 turtles at Cabuyal and 5.3 ± 1.5 turtles at Ostional and was less than one turtle per year for Caletas (0.4 ± 0.5 turtles) (Table 1). Mean (± SD) annual number of nests over five years ranged between 8.6 ± 7.7 nests at Nombre de Jesús and 22.8 ± 10.8 nests at Ostional, and 3.8 ± 5.2 at Caletas (Table 2). 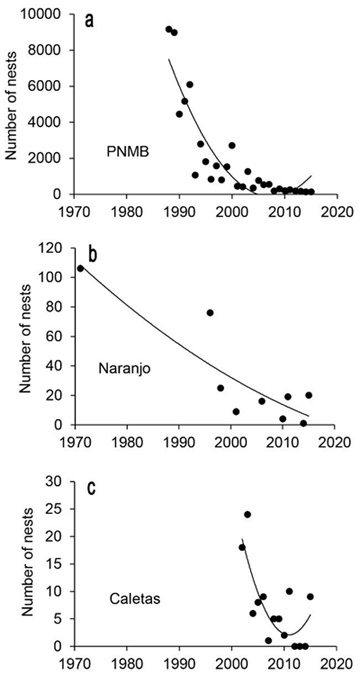 At Naranjo and Caletas, the two sites with the longest running programs, the number of females and nests declined (Fig. 3). of nests estimated based on body pit counts and 90% nesting success. two longest running projects on secondary nesting beaches. In general, most females identified on secondary beaches remained at the same site, although we did detect a low level of exchange between beaches. At Ostional, 12 out of the 43 identified females were observed at least once at other sites (28%). At Naranjo, 4 out of 21 females were also observed at other beaches (19%). At Caletas, 1 out of 15 turtles were observed elsewhere (7%) and at Cabuyal, 2 out of 15 turtles were observed at other beaches (13%). Protection level varied among sites. Some secondary beaches were protected as National Parks (Naranjo in Santa Rosa National Park), which is the highest level of management protection, Wildlife Refuges (Ostional and Caletas) or were not protected under an official management category (Cabuyal and Nombre de Jesús) (Fig. 2). EP leatherbacks have precipitously declined since monitoring projects started in Mexico and Costa Rica in the 1980s, which led to their classification as "Critically Endangered" on the IUCN Red List of Threatened Species™ (Wallace et al., 2013). That assessment was based on the decreasing number of nesting turtles and nests quantified on the index beaches of both countries (Santidrian-Tomillo et al., 2007; Sarti-Martinez et al., 2007). Our results indicate that as the population declined in numbers of nesting females and nests, some beaches that formerly hosted regular nesting now host only sporadic nesting (e.g., Caletas and beaches of the Osa Peninsula). As a result, the geographic distribution of leatherback nesting in Costa Rica has been reduced to the Santa Elena and Nicoya peninsulas and is currently constricted to around an area about ~50 km north and south of PNMB. We defined a secondary beach as a location where turtles nest regularly but in lower numbers than at the index sites. Consequently, beaches that do not receive nests regularly (i.e., every year), may not qualify as secondary sites. Since the mean annual number of turtles registered at Caletas over five nesting seasons was lower than one turtle, we think that nesting at this site may have become sporadic. Nesting levels likely depend on the overall nesting numbers at the population level, which are currently very low. Thus, we cannot be certain that Caletas has become a site with sporadic nesting, considering its importance as a secondary beach in the past. However, the lack of turtles over three consecutive years and the low mean annual number of females per year, serves as an indication that the beach may be in the process of becoming a site with sporadic nesting. Additionally, as the exchange rate registered at Caletas was the lowest among secondary sites, protection of nests on this beach may be essential, as future recolonization could be difficult. According to metapopulation theory, sites where subpopulations are extirpated and become extinct could be recolonized with immigrants from areas with extant subpopulations (Ebenhard, 1991). Movement of individuals between patches normally occurs from those areas that are of better quality and higher abundance (source areas) toward areas of lower quality that are maintained by immigration (sink areas) (Pulliam, 1998). Changes in dispersion patterns between subpopulations caused by shifts in source-sink roles (i.e., sink areas become source areas and vice versa) occur in some species, such as the Audouin's gull (Larus audouinii) (Oro, 2003). Thus, it is possible that historical secondary beaches such as those identified by Mayor (1998) in the 1990s that currently receive sporadic nesting, will be recolonized with individuals from index or secondary sites. The quality of beaches as suitable nesting habitat for leatherback turtles could also change overtime resulting in changes in source-sink roles. However, the number of nesting turtles has declined to critically low levels, with only 26 turtles identified nesting at PNMB in both 20142015 and 2015-2016 (historically lowest levels) and <5 turtles per beach per season on secondary beaches in the last five years. This historically low abundance likely jeopardizes the ability for recolonization of former secondary sites. The probability of extinction is very high for all locations, especially for those beaches with extremely low nesting abundance and with low exchange rate, making recolonization very unlikely after extinction. If current dispersion rates and patterns are maintained, we would expect that the sites where leatherback turtles exhibit the lowest exchange rate would be extirpated first. This might have been the case for Caletas, where we identified the lowest exchange rate (7%) historically and the mean number of females nesting per year dropped to less than one turtle per year in the last five years. In contrast to Caletas, but in support of the apparent importance of high exchange of females among beaches, the beach that registered the greatest exchange rate (Ostional) was also the beach with the highest number of females and nests among secondary sites. As expected, a similar declining trend to the one documented at PNMB was observed at Naranjo and Caletas, the two longest running projects on secondary beaches (Fig. 3). This suggests that the declining subpopulations reflect an overall trend in the metapopulation, rather than a change in nesting distribution, caused by the same drivers of population decline. These drivers have been identified as high rates of mortality related to interactions with fishing gear, particularly in small-scale fisheries in South America (Alfaro-Shigueto et al., 2011), and unsustainable egg harvest on nesting beaches throughout EP leatherbacks' nesting range in Mexico and Central America (Sarti-Martinez et al., 2007; Santidrian-Tomillo et al., 2008). This would also apply to leatherback distribution and trends at the regional scale. The nesting populations of Mexico and Costa Rica are genetically indistinguishable, which could be due to imprecise natal homing (Dutton et al., 1999). However, nesting exchange between the two countries is rare. In Mexico, inter-beach exchange is common but the decline in nesting turtle abundance nationwide has mirrored that of Costa Rica (Sarti-Martinez et al., 2007; Wallace et al., 2013). We found that there was some exchange of females between secondary beaches (7% to 28%). Beach exchange was previously reported to occur within index beaches of PNMB (Santidrian-Tomillo et al., 2007) and is frequent in populations of Atlantic leatherback turtles, where they can move between beaches separated by several hundred km located in different countries, such as in between French Guiana and Surinam (Girondot et al., 2007) and within Caribbean countries (Troëng et al., 2004; Ordonez et al., 2007). In addition to beach exchange by nesting females, there could be country wide and regional wide mixing between life stages. For example, a vast majority of females nesting on secondary beaches remained nesting on the same beach, but these females could have been hatchlings produced elsewhere. Female hatchlings produced at one beach could return to nest on a different beach as adults, or male turtles could mate with females that nest on different beaches, facilitating gene flow between sites. Comprehensive, long-term monitoring of several nesting sites that all serve the same population is critical for informing population-scale conservation strategies. It is possible to develop monitoring protocols to rapidly assess nesting abundance and trends on multiple sites (Delcroix et al., 2013). Aerial surveys, boat surveys, and drones can also enable scientists to quickly assess nesting activity over large regions (Witt et al., 2009; Bevan et al., 2015; Metcalfe et al., 2015). Optimizing efforts to increase coverage, while reducing time spent on each beach is especially desirable when funding is limited. However, from a conservation perspective, it is critical to maintain a permanent presence on beaches where poaching pressure is high. Monitoring programs on index beaches have been essential elements of conservation efforts for protecting the most important sea turtle nesting sites, and also provide a platform for generating estimates of population trends. However, given the dire status of the EP leatherback population, protection of index beaches is insufficient by itself as a beach-based conservation strategy without expanding efforts to secondary beaches. Marine Protection Areas (MPAs) designed to protect index beaches might not always work at recovering populations of sea turtles because pressures can change over time and space (Nel et al., 2013). The effect of localized conservation efforts on some sites for the overall population is not clear. The level of protection varied among nearby leatherback nesting sites. Secondary beaches were either protected as National Parks, Wildlife Refuges or lacked official protection. PNMB was created in 1991 and ratified in 1995 to protect the site with the highest abundance of leatherback turtle nests in Costa Rica and thus, funding was accordingly allocated to its preservation over the years. However, secondary beaches could also contribute to overall population status (e.g., changes in source-sink roles emphasize the value of small sites, Oro, 2003). Thus, the lack of management on some secondary sites could have detrimental implications for the leatherback turtles in PNMB, and the metapopulation as a whole. Egg poaching is a common threat to sea turtles in Costa Rica and was one of the main drivers of the population collapse at PNMB. Approximately, 90% of leatherback clutches were poached for ~20 years before the Park was established (Santidrian-Tomillo et al., 2008). This anthropogenic source of mortality also contributed to the population decline of leatherback turtles in Mexico (Sarti-Martinez et al., 2007). Levels of poaching in Mexico have been consistently reduced over the years although, poaching pressure is still high and effective conservation depends on human presence on the nesting beaches (Lopez & Sarti, 2016). Likewise, egg poaching was gradually eradicated at PNMB following establishment of the National Park, but continued on most secondary beaches and still occurs on some of them. Although protection of nests has been effective in controlling poaching within PNMB, failure to reduce or eliminate this threat at other beaches where leatherbacks nest also hinders the recovery of the nesting population at PNMB and the population overall. Although, healthy sea turtle populations should be able to sustain some level of poaching (i.e., natural predation of eggs), the combination of very high levels of human egg poaching and high rates of fisheries induced mortality is unsustainable and has had an overwhelming effect that has brought the EP leatherback turtle to the brink of extinction. Other threats such as climate change and urban development of nesting beaches could additionally impact EP populations of leatherback turtles as these become depleted preventing recoveries (Saba et al., 2012; Roe et al., 2013). Finally, the total disappearance of nesting beaches and not only declining numbers, also have an effect on sea turtle populations, especially since low nesting numbers make recolonization difficult. This type of disappearance occurred in the Caribbean where some historically large and small nesting populations were extirpated (McClenachan et al, 2006). The green turtle (Chelonia mydas) population of the Cayman Islands, once one of the largest populations in the world, was extirpated in the 1800s. Despite the implementation of protection 200 years ago, the number of nesting turtles has not yet recovered and nesting is currently sporadic (Aiken et al., 2001). Likewise, the large population of leatherback turtles that nested at Terengganu, Malaysia in the 1950s is currently considered functionally extinct and it only receives sporadic nesting (Chan & Liew, 1996; Benson et al., 2015). Unfortunately, we do not yet understand metapopulation ecology of leatherback turtles and the number of turtles is too low in the EP to identify patterns properly. The study of population dynamics at the metapopulation level of Atlantic leatherback turtles could help filling these gaps in knowledge. For example, differences among subpopulations could exist in beach exchange, immigration rates, fluctuations in nesting numbers and changes in source-sink roles. This information would help in the development of more effective conservation plans at the metapopulation level. As specific information on the EP metapopulation is currently lacking, protection should include as many beaches as possible and conservation strategies should pay attention to the complete loss of nesting sites where nesting abundance is currently low because local extinction may be irreversible. Beach protection, although not fully achieved, has been insufficient to prevent population declines of EP leatherback turtles. As interactions with fisheries have likely largely contributed to the population collapse (Spotila et al., 2000), reducing fishery bycath in the ocean is essential for beach protection to be effective. Thus, an integral strategy to protect EP leatherback turtles in the ocean and on the beaches is needed to stop declining trends and allow recoveries. We thank the numerous research assistants and volunteers that have collaborated in beach protection and participated in the data collection at all sites. Research permits were obtained from the Guanacaste Conservation Area (ACG) and the Tempisque Conservation Area (ACT), of Costa Rica. We thank Roger Blanco, Nelson Marin and Roberto Zúñiga for facilitating the processes. Funding was provided by The Leatherback Trust, Rufford Small Grants Programme, International Students Volunteers (ISV), The National Fish and Wildlife Foundation (NFWF) and the U.S. Fish and Wildlife Service (USFWS). The U.S. Fish and Wildlife Service's Marine Turtle Conservation Fund supported the initial workshop in 2013. We additionally thank Fundecodes, Ostional National Wildlife Refuge and the communities of Ostional and Cabuyal.